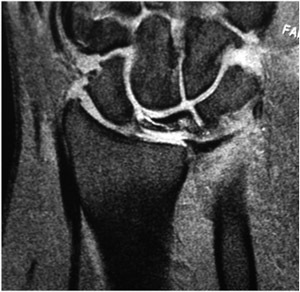 Kienbock's disease as a rare cause of wrist pain. 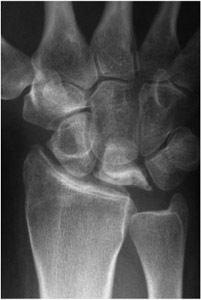 In Kienbock's disease the lunate bone, which is one of the small bones in the wrist, dies (osteonecrosis) and collapses. The cause of this rare condition in unknown but it is thought that it occurs as a consequence of disruption in the blood supply to the lunate bone. Trauma is not generally considered to cause the condition. Wrist pain: This is usually how the condition presents. The pain can vary in severity and may be mild. X-rays: These show characteristic changes. In the early stages of the condition, x-rays can be normal. An MRI scan is useful as this can show an alteration in the blood supply to the lunate bone. which is characteristic of the condition. Figure 2: MRI scan of Kienbock's disease showing the lunate collapse.